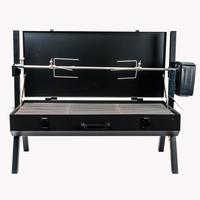 BBQ Spit Rotisseries: Gas or Charcoal? 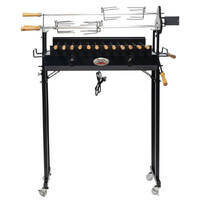 Choosing the best type of spit rotisserie is a difficult task for many BBQ spit roasting lovers. 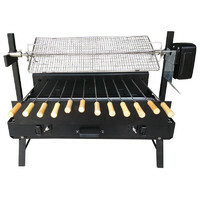 There are two main options to consider with barbecue rotisseries either being operated through gas or powered by charcoal. Both have their pros and cons and understanding the key facets will help you determine the best option. 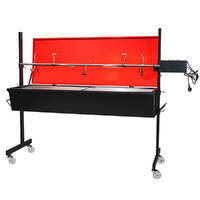 Convenience is the main factor that a gas spit rotisserie offers over charcoal. 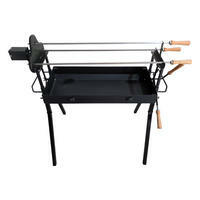 A gas spit rotisserie heats up quickly and can be easily set at the desired temperature for cooking your meat. 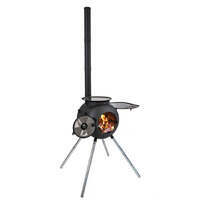 A gas rotisserie can light and heat up in a just a matter of minutes. With a charcoal spit rotisserie you may need to wait thirty minutes (or more if you stuff it up) to get your desired heat. Convenience is a major plus of having a gas BBQ spit rotisserie but it is important to note that you are ultimately sacrificing a certain amount of flavour in your meat. Clean up can also be a headache for a lot of people. When using gas rotisserie, there is no need for you to worry about cleaning the base compared with the use of the charcoal counterpart which can stay hot for hours after cooking. 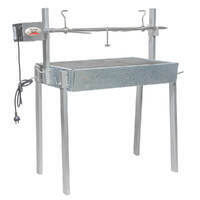 Price is also a major point to consider when purchasing a BBQ spit rotisserie. Generally, gas BBQ spits are more expensive and offer less variety in selecting a spit. This is due to stringent gas approval processes a company must go through before being able to legally sell a gas spit roaster in Australia. The approval process can cost $10,000 and 6-12 months. This is why there are only a handful of commercially sold gas spits available for purchase. Purchasing a gas spit which hasn’t been approved by the Australian Gas Authority can be risky and may be putting your home and family at risk if something goes wrong. 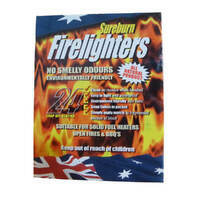 If you're only going to be cooking for a small number of people, consider adding a spit kit to your existing gas BBQ. 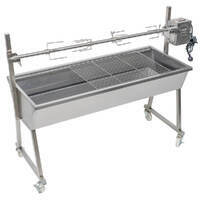 If your ultimate goal is convenience combined with minimal clean up and you are willing to sacrifice some of the flavour of your meat then a gas BBQ spit is a great choice. When it comes to taste, charcoal BBQ spits really stand out. As the meat cooks, fire and smoke is absorbed by your food giving that smoky, authentic flavour that really enhances the flavour. 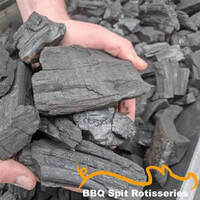 Mallee root charcoal tends to be the charcoal of choice when cooking on a charcoal BBQ spit, however lump charcoal can also be used, but not quite as flavoursome. 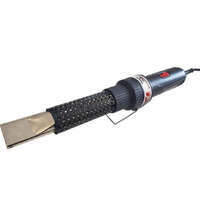 Some people have trouble lighting charcoal and therefore think it's too much of a hassle, however the trick to lighting charcoals is to use a charcoal chimney fire starter. 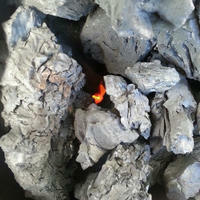 By using 2-3 fire lighters and a charcoal chimney fire starter, you'l' perfect coals and be ready to cook in 20 minutes. 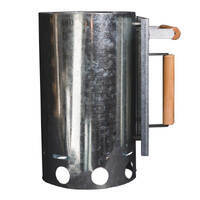 Because charcoal BBQ spits don’t need to go through a stringent approval process, there are a wide range of sizes and models with many at a lower cost than a gas spit. 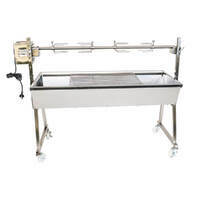 The final and important factor to consider when selecting a BBQ spit rotisserie is the social aspect. Cooking with charcoal creates an exciting and entertaining atmosphere for a family gathering, a get together with good mates or a large function for your sporting club. There is something about a fire that naturally draws people in. Maybe it stuck with us from back when cavemen gathered around an open fire to cook their food and socialise. 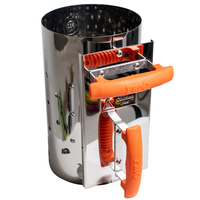 To read more about selecting the spit roaster that is best for you, click here to download our full Spit Roaster Buying Guide.